Historical Map of Houston Heights. Image available on the Internet and included in accordance with Title 17 U.S.C. Section 107. Purchased land being cleared for the Houston Heights development, 1892. Courtesy of the Houston Heights Association. Image available on the Internet and included in accordance with Title 17 U.S.C. Section 107. One of Houston Heights's Streetcars. Courtesy of the Houston Heights Association. Image available on the Internet and included in accordance with Title 17 U.S.C. Section 107. Heights residents celbrated the Golden Jubilee in 1941, celebrating its 50th anniversary. Courtesy of the Houston Heights Association. Image available on the Internet and included in accordance with Title 17 U.S.C. Section 107. Houston Heights updated Main Street shopping. Image available on the Internet and included in accordance with Title 17 U.S.C. Section 107. HOUSTON HEIGHTS, TEXAS. Houston Heights, a suburb of Houston four miles north of the downtown area in central Harris County, was built on and named for its site on high land, bordered by White Oak Bayou. It was on the Missouri, Kansas and Texas line. The townsite, originally part of the John Austin grant sold to I. W. Brashear in 1872, stood sixty-two feet above sea level and 1½ miles from Houston's Grand Central depot. Around 1891 Daniel Denton Cooley, treasurer of the Omaha and South Texas Land Company, moved to Houston to plan and manage the new town for company president Oscar Martin Carter, who obtained financing from directors in Boston. Marmion Park was later established at the site of the community's first house, which had been built for Cooley in 1892. The 1,175-acre site of Houston Heights, one of the first planned communities in Texas, was subdivided into residential and industrial districts. The work began in 1892, as workers marked streets and alleys named for American colleges and universities, macadamized Heights Boulevard, and laid an electric street railway system to connect the suburb to Houston. A steam freight line linked up with the Houston and Texas Central Railway to haul factory products. When several yellow fever epidemics struck Houston in the late nineteenth century, many residents fled temporarily to the Heights. In the 1890s the town acquired its first school (named for Daniel Denton Cooley), the Coomb's Park or Forest Park amusement center, a hotel later converted into the Texas Christian Sanitarium, and an opera house. Clifford Grunewald commemorated the community in his "Houston Heights Polka," first published at Houston in 1893. Two newspapers, the semiweekly Houston Heights News and the Suburbanite, were published at various times. The Houston Heights post office operated from 1894 until 1915. 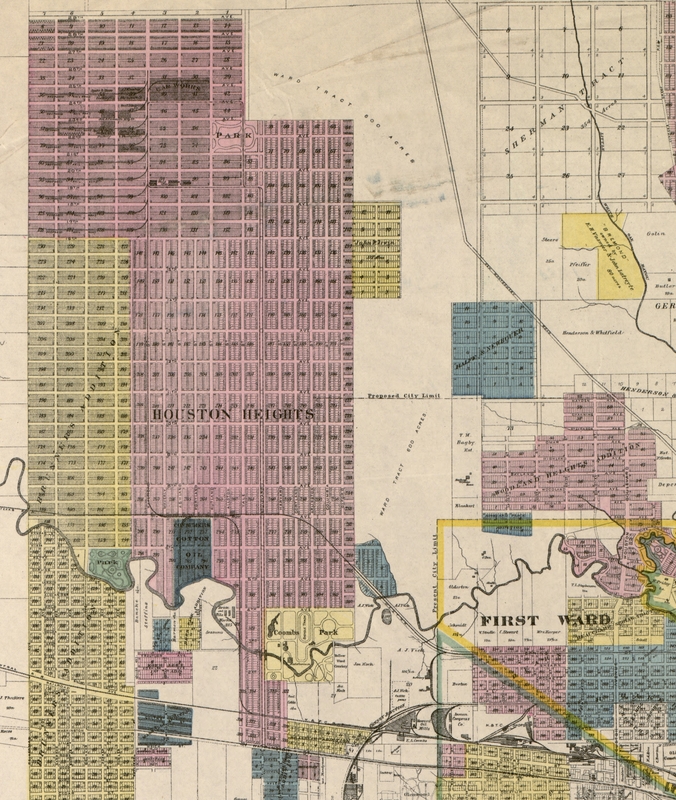 The city of Houston Heights incorporated in 1896, though the Omaha and South Texas Land Company was forced to liquidate its assets that year, due to the effects of the panic of 1893. During the Spanish-American War recruits trained at a tent encampment, Camp Tom Ball, on the east side of Heights Boulevard. After 1900, businesses in Houston Heights included a pickle factory, a sawmill, a brick and tile manufacturer, and a venetian-blind factory. A small Mexican community grew up at Factory Village around the Oriental Textile Mills, where workers made cloth from camel hair. In 1900 the population of Houston Heights was 830, but by 1908 it was 6,000, and at that time a host of handsome mansions lined the boulevards. The high school opened in 1904, and two black schools were operating by 1910. The community's population increased to 9,000 by 1915. In 1918 Houston Heights residents voted for annexation by the city of Houston. The area had begun to decline by the 1950s, and in 1973 the newly founded Houston Heights Association campaigned to preserve the suburb. In 1991 a Texas Historical Commission marker detailing the neighborhood's history was placed on Heights Boulevard. 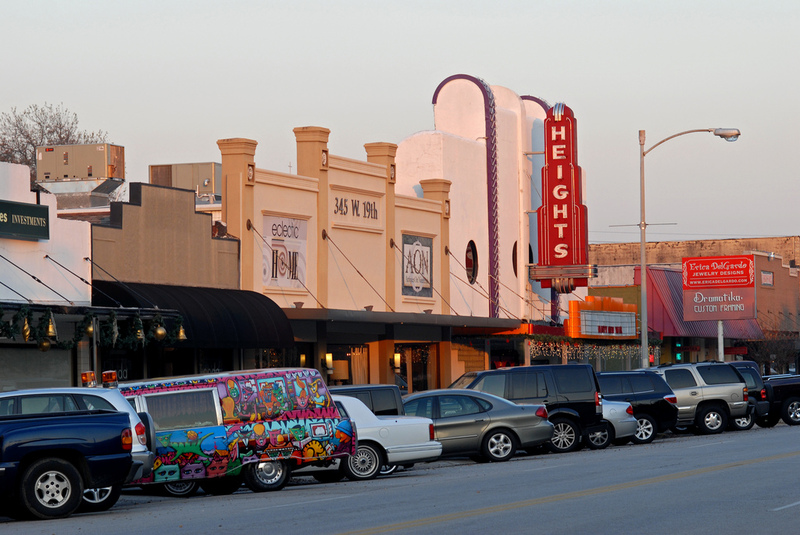 By that time more than 100 Houston Heights structures were listed in the National Register of Historic Places, and the suburb was a member of the Texas Urban Main Street program, which sought to revitalize the area. Sister M. Agatha, The History of Houston Heights, 1891–1918 (Houston: Premier Printing, 1956). Arnoldo De León, Ethnicity in the Sunbelt: A History of Mexican-Americans in Houston (University of Houston Mexican American Studies Program, 1989). Marguerite Johnston, Houston, The Unknown City, 1836–1946 (College Station: Texas A&M University Press, 1991). Handbook of Texas Online, Diana J. Kleiner, "HOUSTON HEIGHTS, TX," accessed April 19, 2019, http://www.tshaonline.org/handbook/online/articles/hvhab.